NCOALink is a tool designed for mailers and database managers to ensure that their mailing lists are kept up-to-date. NCOA stands for National Change of Address. It is an information tool for database managers & mailers to use before mailing. NCOA has gone through some changes over the years...for example, the current term is NCOALink. But the process is the same as always: updated addresses are matched to your input addresses and then appended to your data. The list you get back has all your original data plus the updated NCOA data. Ok, where does the data come from? Think back to the last time you changed residence...chances are pretty good that at some point - either before or after your move - you headed down to the nearest Post Office and filled in one of those yellow change of address cards or you did it online at USPS.com. These COA cards - known in the industry as PS Form 3575 - tell the Post Office basically two things: 1) to stop sending mail to your old address, and 2) to start sending mail to your new address. Additionally, the form tells the Post Office what type of move you are making: Individual, Family, or Business. After you submit a change of address card to the Post Office, your new residence information makes its way to the USPS National Address Information Center (NAIC) in Memphis. The first thing they do with your new address info is standardize the address (with ZIP, ZIP4, and Delivery Point information), then they enter your new address into the National Change of Address (NCOA) masterfile. Every week, providers of NCOA processing services receive masterfile updates from the USPS. This information, in turn, is made available to mailers whenever they upload a file for NCOA processing. By matching their list against the NCOALink file before mailing, mailers are able to quickly and efficiently ensure a higher deliverability for their mailing. Additionally, there are two levels of NCOALink service available: 1) the 18 month dataset, and 2) the 48-month dataset. The 18-month is called 'limited NCOA' and the 48-month is called 'full service NCOA'. 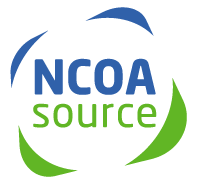 NCOAsource provide its users with the full 48-month dataset (not the 18-month file), ensuring that they have access to the greatest breadth and depth of COA data possible. Before updating your list, a USPS PAF (Processing Acknowledgment Form) must be completed, and faxed back to 775-201-1811 attn: PAFs. You can get the PAF by clicking on Get Started Today, to the right of page. NCOA, NES, LACS, DSF2 processing performed by a non-exclusive licensee of the United States Postal Service. Prices are neither established, controlled, nor approved by the US Postal Service. NCOA and ZIP+4 are trademarks of the United States Postal Service.